I didn’t go far from home for this one. Tom Indelicato and I teach together at Bishop Guertin High School. Some years ago I hired him to be the fill a need for a computer science teacher. One of the best moves I’ve made. This past January he hired me to come back to BG as a teacher after I left Microsoft. 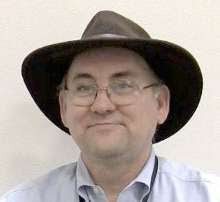 Besides teaching computer science, Tom is also the faculty mentor for the school’s FIRST Robotics Team 811. He’s seen at a FIRST event in this picture. After 17 years of programming in industry, I decided to answer what I considered a call from above and make change. Haven’t looked back. My goal is to “infect” as many students as possible with the same love that I have for programming. I use project-based lessons, and my lessons a rife with stories from my professional career. 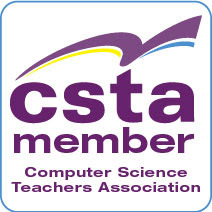 As only one semester is required for graduation, my biggest challenge is getting kids to consider a second CS class. This was the inspiration for the new ECS class. Generally, I’d say the administration is supportive of the CS program; there’s almost never been a time when resources were denied, and they’re open to suggestions for improving the program. I see success in the long list of students who’ve gone on to study CS or engineering, but my hope with ECS is to see this list grow faster.